Alain De Botton devotes one chapter of his book The pleasures and sorrows of work to the practice of Transmission Engineering, accompanying one such engineer named Ian – also a founding member of the Pylon Appreciation Society – on a walk along “one of United Kingdom’s most important power lines,” from “a nuclear plant on the Kent coast” to “a substation in East London.” Along the way, in addition to a lecture on the physics and mathematics of this subject, we are treated to a theory of pylon aesthetics. 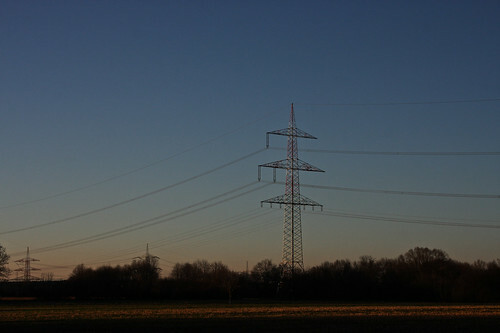 The Beauty of Electricity pylons in the Dutch Landscape was a defence of the contribution of transmission engineering to the visual appeal of Holland, referencing the often ignored grandeur of the towers on their march from power stations to cities. Its particular interest for Ian, however, lay in its thesis about the history of the Dutch relationship to windmills, for it emphasised that these early industrial objects had originally been felt to have all the pylons’ threateningly alien qualities, rather than the air of enchantment and playfulness now routinely associated with them. They had been denounced from pulpits and occasionally burnt to the ground by suspicious villagers. The re-evaluation of the windmills had in large part been the work of the great painters of the Dutch Golden Age, who, moved by their country’s dependence on these rotating utilitarian objects, gave them pride of place in their canvases, taking care to throw their finest aspects to relief, like their resilience during storms and the glint of their sails in the late afternoon sun. It was works such as Abraham Funerius’s Het Bolwerk Rijzenhoofd te Amsterdam and Jacob van Ruisdael’s Molen bij Wijk bij Duurstede which had inspired the Dutch to accord decisive respect and aesthetic attention to their life-giving machines. Ian concluded that it would perhaps be left to artists of our own day to teach us to discern the virtues of the furniture of contemporary technology. He hoped that photographs of conductors might in future hang over dining tables and that someone might write a libretto for an opera set along the grid. I have mixed feelings about pylons. Sometimes I love them cos of the birds they host. Sometimes I hate them, cos they can destroy a line of vision. On the other hand, this is India, leave a pylon be and in a few years it will be swallowed up by vegetation. Seen that happen so often. Love it. I just realized, after reading this comment, that I have no memory of pylons in India. Now I know why. 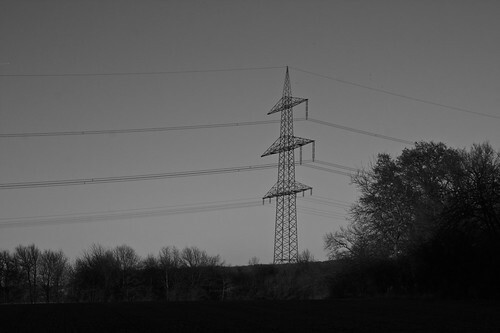 It’s very interesting that you mention this Julia, because it reminded me of my trip to Iceland where the pylons – really simple ones with just two wires crossing them – showed how little that countryside was inhabited. They are signs, and they can speak a lot.